Observation - White fallow stag - UK and Ireland. 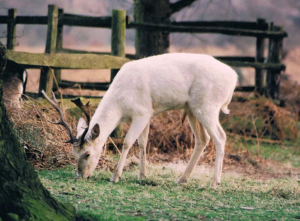 Description: A white fallow stag, fairly immature going by the antlers. Originally thought (by me at least) to be an albino form, but see discussion below - very interesting! A white fallow stag, fairly immature going by the antlers. Originally thought (by me at least) to be an albino form, but see discussion below - very interesting!